Traditional silica aerogel is manufactured according to the so-called sol-gel method, which involves the synthesis of a porous silica network in a wet process. Subsequent drying must be performed under supercritical conditions for the solvent used in order to avoid shrinkage or collapse of the silica network under the influence of the surface tension. This means that the process conditions in terms of temperature and pressure will be very demanding. Modern versions of aerogel use carbon dioxide as the final solvent, which has brought the temperature down to just above room temperature but still at a very high pressure (70 bar). Other versions involve a process where the silica structure is reinforced with a resin prior to drying, which considerably lowers the shrinkage without the need for supercritical drying. On the other hand, the resin has to be removed by calcination, i.e. heating up the material to about 500 C where the resin is burnt away. Aerogel is most commonly made into monoliths or granules < 5 mm. The production of Quartzene® is performed under almost ambient conditions. It is therefore considerably less expensive than traditional aerogels produced by supercritical drying or resin reinforcement/ calcination. Quartzene® is typically made into a fine-grained powder but larger sizes can also be produced by applying various granulation techniques. To better cope with the other materials involved in the different end products, a suitable version of Quartzene® needs to be selected, see Figure 1, then adapted and modified to, e.g. facilitate production as well as receive desirable final properties. These alterations involve e.g. 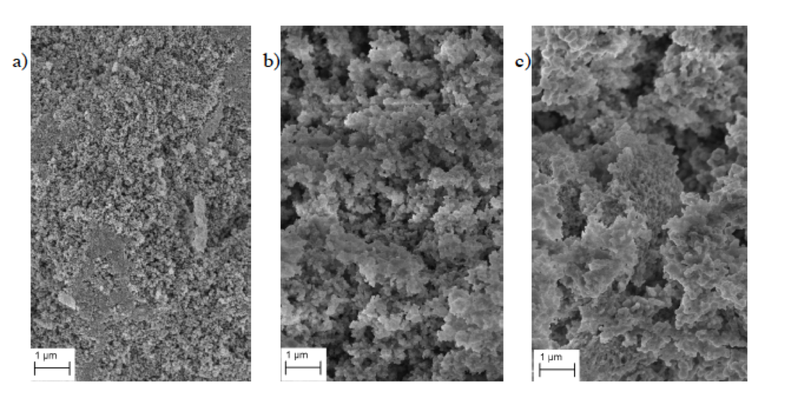 the choice of granulation size and strength, see Figure 2, modification in terms of surface wettability, resistance to the alkaline environment in concrete and establishing sufficient mechanical strength needed for the various mixing processes. The crucial property that will determine the performance of the final product while in use is its thermal properties, particularly the thermal conductivity. The three different types of Quartzene®, hot air oven dried pellets, at the same magnification in the SEM. a) CMS, b) E9, c) ND.